Cedar City was once known as the gateway to Zion, Bryce and Grand Canyon National Parks and the nearby Cedar Breaks National Monument. With these tourist destinations in mind, the Union Pacific Railroad built a spur to Cedar City in 1923. Today the passenger station, no longer operating, is being used as a restaurant. 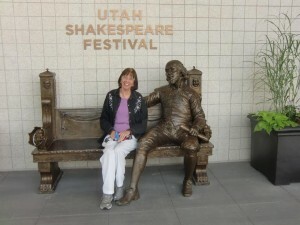 Although we have visited the parks many times, our main interest is within the city itself, the Utah Shakespeare Festival. We discovered this wonderful festival about ten years ago and have returned to it nearly every year since. The idea for a Shakespeare festival in Cedar City was “hatched” in 1961 by Fred C. Adams, a professor at what is now called Southern Utah University. The first production was in the following year with temporary sets. So many people attended year after year that they decided they needed permanent facilities for the festival. This has all led to what we see today in the festival complex. The Randall Jones Theater is a huge indoor auditorium where Shakespeare plays and plays by other playwrights are performed. Newest, is the Engelstad Shakespeare Theater, an outdoor theater resembling the Old Globe Theater in London where Shakespeare’s plays were originally produced. These theaters plus the Southern Utah Art Museum and the Southern Utah University across the street form an unusual combination of the arts and learning. We drove to Cedar City this past August, passing straight through Las Vegas, spending one night along the way at Mesquite, Nevada. It is a long haul, but certainly worth it. The drive from Mesquite to Cedar City, climbing steadily all the way, is interesting in itself, especially driving on I-15 as it winds through the mountainous Virgin River Gap, towering cliffs on all sides. This section of I-15 is a miracle of modern engineering. Soon after emerging from the gap we passed through St. George, Utah with its huge white Mormon cathedral, the largest in the state. As we near our destination the reddish hills are covered with healthy juniper trees, once thought to be cedars and giving Cedar city its name. By the time we reach Cedar City at six thousand feet we can look over the town at the red-stained mountains dotted with pines. Jedidiah Smith, the “Mountain Man”, explored the area in 1826 and was soon followed by the Mormon pioneers in 1851. 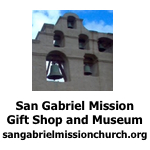 The city began with the smelting of iron and the men who worked the operation. Rich deposits of iron ore and seams of coal in the area were perfect for the smelting of iron. Cedar City, population 29,000, is located in Iron County. But about the Utah Shakespeare Festival! This past summer we saw Romeo and Juliet and As You Like It in the outdoor Globe-like theater and A Midsummer Night’s Dream, Shakespeare in Love and Guys and Dolls at the inside theater. All were acted and staged with perfection. Before the evening performances the festival presents a Green Show where actors dance and sing on a stage outdoors and spectators watch them on area of sloping grass. This is very popular, so people save their places early. Children especially enjoy the show, often mimicking the performers by dancing along with them. Also, prior to the evening performances, some of the festival leaders will offer an overview of the play the audience is about to see. The following morning, professors or experts lead a discussion of the plays. Those who have seen the plays can ask questions about the performances or simply express their opinions. These sessions are very popular. The festival offers backstage tours, taking people behind the scenes as well as talks about costuming and stage props. Special lunches are held weekly featuring some of the actors who talk about their lives and their acting. The experiences at the festival are so pleasant and exhilarating that we have returned year after year. The main season of the festival is from June through August, also the time for Utah’s monsoon season. Days are generally clear in the morning, but beautiful clouds begin to build with the first heat of the day, adding character to the deep blue sky. By afternoon, on some days, clouds develop into showers or thunderstorms that are usually brief. If you are in Cedar city for the Utah Shakespeare Festival I recommend side trips to Kolob Canyon, mentioned in last month’s article, or Cedar Breaks National Monuments, both spectacular places to visit. 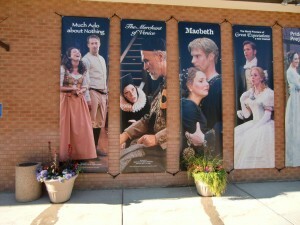 These signs demonstrate the quality of the plays produced at the Utah Shakespeare Festival. 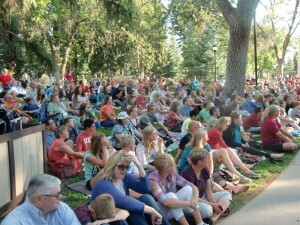 People take their seats on the grass to watch the popular greenshows. 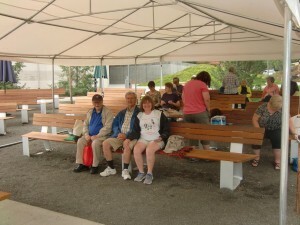 People begin to gather in the morning for discussions of the plays seen the previous day. The photographer (Dolores Seidman) sits with William Shakespeare just before the play.